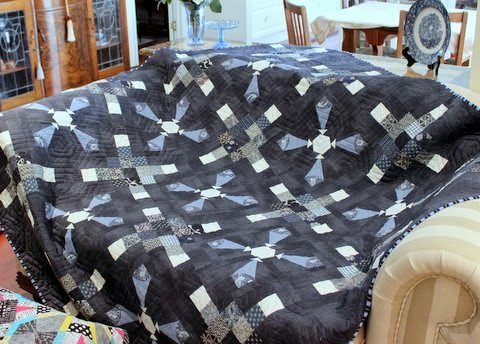 Down Under Quilts Issue 164, 2014 is filled with blue and white projects. I was lucky enough to have a project in this issue – Tranquil Blues. It is a simple design, using piecing and appliqué, made from mostly Moda Kasuri and scraps from my stash. The white is from the Pure Elements solids by Art Gallery Fabrics. Quilted with Aurifil 50wt 1248 cotton using a nested hexagon pattern. Bound with a stripy binding by Timeless Treasure. These are my photographs taken before I sent the quilt to the magazine. Finished Quilt size 72″ x 72″. It is nice to see someone else used Kasuri. It didn't stay around for too long. 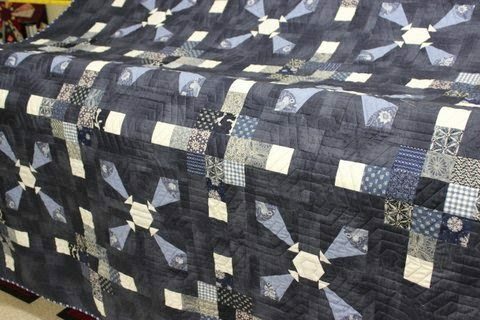 What a stiking quilt! 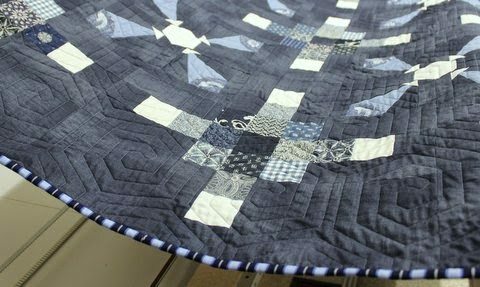 I love the indigo blue mixed with the other scrappy blues. I'll make sure I check out Down Under Quilts to see the magazine photos too.